Is your customer engagement platform provider doing enough to help you break down conversation silos? Businesses committed to delivering exceptional customer experiences need to be wherever their customers are. Few would argue with that premise. The challenge is that in today's multichannel world customers are everywhere. In the last few months, Google, Facebook, and Apple have all debuted platforms that allow businesses to connect with customers through modern messaging apps. That's because these tech behemoths realize that chat apps are where most consumers spend their time these days, whether on Facebook Messenger, WhatsApp (also owned by Facebook), Apple iMessage, or regionally specific apps like WeChat, Telegram, Line, and Kakao. And while chat apps, along with voice assistants like Google Home and Amazon Alexa, may be the new kids on the block, they're not the only channels businesses have to worry about. Email, SMS, Web chat -- and yes, good old phone support -- haven't gone anywhere. So how does a customer-centric business go about managing all these new and legacy channels simultaneously? As I wrote in my last No Jitter post, they should look toward their existing customer engagement platforms for help. In today's market there is no good reason for any contact center or help desk not to support all the channels, including emerging ones such as Apple Business Chat and WhatsApp for Enterprise, which both are in early access and expected to become generally available later this year. Allowing you to access all these channels, however, is only the first step. The second is making sure these channels don't exist in isolation so the user experience doesn't suffer as a result. That's the omnichannel dilemma, and it's one you should be asking your customer engagement platform to help you address. First, it's worth exploring what the term "omnichannel" means when it comes to customer engagement. Many businesses boast about providing omnichannel experiences when what they actually deliver is "multichannel" support. Multichannel means being wherever your customers are, whether that's the social chat apps, the Web, or wherever else people hang out. That's quickly becoming table stakes. 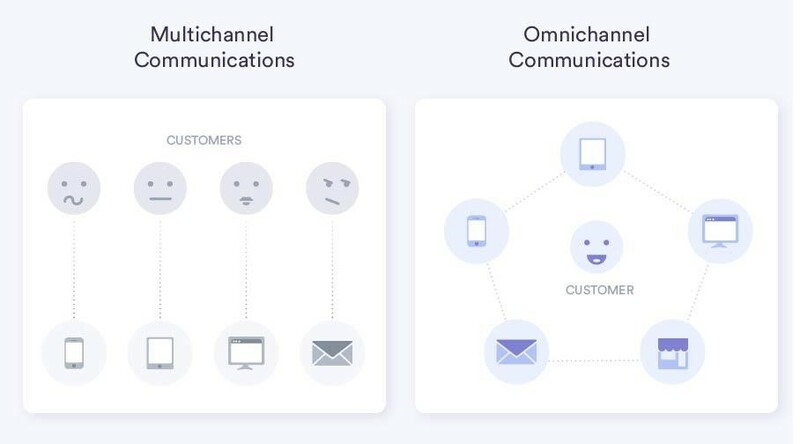 Omnichannel means providing a consistent communications journey for your customers, one where the conversation history and context travels with them from channel to channel. Global contact centers are now focused on this second order challenge; in a 2017 report by Dimension Data, contact centers rank "connecting customer journeys across channels" as their second priority over the next five years. The beauty of modern messaging is that it provides businesses with a treasure trove of context about who their customers are, where they're coming from, and what they've talked about or bought from you in the past. A true omnichannel experience leverages and maintains context across channels, so that no matter where a customer reaches out to you, it feels like one continuous conversation. It's the difference between re-introducing yourself every time you run into someone you know and simply picking up where you left off. While starting from square one every time you talk to someone would be ridiculous, that's exactly how most companies interact with their customers. It's frustrating for the customer and it's inefficient for the business. Above all, it's a waste of everybody's time. If your customer engagement software only allows your agents to talk to customers on different channels, without connecting the dots and providing a unified customer view across all those channels, you're at risk of actually creating a negative customer experience. Such multichannel solutions lead to conversation silos within the enterprise, frustrating the consumer and limiting a business' ability to have a holistic view of the consumer. A true omnichannel engagement platform would give you the ability to talk to the right customer, in the right place, at the right time, without sacrificing context along the way. It would allow you to connect with people on a popular channel like Messenger or WeChat and then easily move the conversation to a more secure and private channel like your own mobile app. It would also allow you to easily authenticate them, even on public channels, so you can provide a fully personalized experience without the risk of a privacy breach. Mostly importantly, it would enable customers to connect with you on any channel without starting from scratch every time. For example, they might prefer to reach out in one place (say, your website) but receive a response somewhere else where and when it's more convenient (like email or text). Whatever the scenario, a true omnichannel experience is about empowering your customers to engage with you on their terms. Enabling these kinds of omnichannel experiences involves some considerable technical gymnastics. Every channel has its own constantly-changing APIs and most business systems don't play nicely with each other. But that shouldn't be your problem as a business, and it certainly shouldn't be your customer's problem. Ask your customer engagement platform what it's doing to help you break down conversation silos and make the omnichannel dream into a reality.